Two reviews from differing viewpoints by husband and wife Cath and John Fenton. John was not only the organiser but sound and lighting man also photographer for the night! The story of this concert begins in St Ives in September of 2011, when Gordon was playing as part of the St Ives Festival. My wife and I went to hear him. During the interval, Hilary was distributing leaflets advertising private recitals. This looked interesting so, on arriving home on the Sunday, we contacted the number on the leaflet, to be told that we really needed to speak to the other Sue. A couple of phone calls later, and Gordon had been booked to play in St Gwladys' Hall, Bargoed, on Saturday 7th July 2012. Subsequently, it was agreed that he would also do a “Meet the Artist” session during the afternoon. In due course, posters arrived and we started to tackle the nightmare that is publicity. Perhaps I should explain that, as may be apparent, 'we' are very new to this game. St Gwladys' Hall is our Church Hall (St Gwladys' Church, Bargoed and, yes, there really is a Saint Gwladys) which was extensively renovated before being handed over to the local Council for them to use as the town Library whilst they renovated other premises to become the Library's long-term home. After three years, the Hall was handed back to us in November of last year. Because we wanted the Hall to become a community facility, we engaged a full-time Community Development Worker, Mary-Bridget Flynn-Samuels, to co-ordinate things. My role in the scheme of things is that of general gopher and technical gnome. Booking Gordon to play for us was our first venture into Big Name Concerts, our toe-in-the-water to see whether such a thing was even possible. Given that our auditorium is not large (a capacity crowd would be 120 people), it was always going to be something of a gamble. On the other hand, I was determined that I wanted to hear Gordon playing again and, if that meant in effect paying for a large-scale private recital, then that was OK by me. I let myself into the Hall just after 8:00 am on the Saturday morning, making sure that I would have sufficient time to assemble the stage, the lighting rig and the sound rig before Gordon and Hilary arrived mid-afternoon. As the lighting rig had only been used for the first time a week before, I was somewhat nervous about its suitability. The sound rig had only been operated in its present guise twice before, so I was rather apprehensive about that as well. Added to which, Gordon had briefly floored me earlier in the week when I had spoken to him and he had asked whether the foldback could be in stereo? As we had only just worked out how to supply any kind of foldback at all, this was quite a challenge. Happily, I was able to say, and subsequently to demonstrate, that we could offer stereo foldback. I should possibly explain that I am a biochemist by training, but earn my living as a mechanical engineer. I have no formal training in operating sound desks or lighting rigs, but have picked it up as best I can by watching others at work. I find that people are mostly intimidated by a sound desk, which probably explains why, at the time of the concert, I was the only person in St Gwladys' prepared to deal with sound equipment. In consequence I have, over the years, bought most of the sound and light gear that we have. I was very nervous of having all of this put to the test. A phone call from Hilary around 12:30 at least laid one of my worries to rest – they had reached Ross-on-Wye (from near Peterborough) and wondered whether they had time to stop for a bite to eat? I replied that it would take about another hour to reach us, so lunch was no problem. They had the postcode for the Hall, so the sat-nav should take care of the rest. All I will say is that one should not place too much faith in sat-nav. I cannot work out how the device thought it was a good idea bringing them in the way that it did, but they made it and, as they say, all is well that ends well. The afternoon session turned out to be very informal. I had anticipated possibly sitting Gordon on the platform, possibly with myself as a sort-of chairman, whilst members of the audience fired their questions at him. In the event, there were no more than a dozen of us sitting around tables on the floor of the Hall. Gordon seemed to like the informality and so did everybody else, so why not? The first question was a very good one, “Who would you say have been the greatest influences on your music?” The answer took nearly half an hour and, as the questioner remarked to me afterwards, “Are we going to have to repair the dents in the floor – all those names he dropped!” But as my friend added, this was not mere name dropping – these were people that Gordon had worked with over many years, big names, famous names, well-known names, names he had every right to drop: Bert Jansch, Hank Marvin, Cliff Richard, Davey Graham, Paul Simon, Rick Wakeman – the list just unrolled. It was fascinating, gaining an insight into this man. And there were the odd pieces of information that led to those moments of, “Of course! Now I understand.” I had watched the film on YouTube of Gordon playing Maddie goes West at the Ullapool Guitar Festival and noticed the curious rocking motion of his right hand as he played. No picking or strumming style that I knew could explain that motion. Then Gordon was telling us how he had developed his style, attempting to flat pick but being flummoxed by the problem of how you sounded two strings at once when they are at opposite sides of the instrument? Which was how he arrived at the technique of using a plectrum and his little finger simultaneously – as he said, not a technique recognised by anybody, but it works for him, and it explained that rocking motion. All was suddenly made plain. And the recollections of a friend. He and I had attended a concert that Gordon gave locally back in 1998. The following day, he had conducted a Masterclass which my friend and I, with considerable trepidation, had attended. My friend observed that he had learnt something very useful at that class, something that Gordon had recommended and that had stood him in good stead many times since – if you make a mistake, do it again, then your audience will think it's jazz! Suddenly it was 5 o'clock and the session was over. Time to shoo everybody out while the sound checks were done. Gordon brought out his armoury – 5 instruments: 6 and 12 string acoustic JHS GG signature guitars, Fret King Elise GG electric, Armstrong 'Baby' and what he later described as the “five pound guitar”. I will admit that I was seriously nervous at this point; I (and my kit) was about to be put to the test – would I pass? “Can we go down a bit on the mains?” “A bit more of the guitar on the foldbacks?” It was almost literally that quick. My guess is that the sound checks took no more than ten minutes before Gordon pronounced himself satisfied, and pleased. “That's a nice sound you've got there.” How much better does it come than that? The approval of a master musician. A break for tea, and back for the concert. Gordon opened the evening with his 'five pound guitar'. He explained that he had picked it up at a boot sale and had a little repair work done on it, “Total cost, maybe thirty five pounds?” All I can say is that it just goes to prove that it is the player, not the instrument, that makes the music. It served to make the point that one does not have to have a top-price instrument to make good music. On the other hand, it may also prove that you have to be Gordon Giltrap to get that sort of music out of a cheap guitar! I learnt one important thing that evening – that there is a different kind of attention involved when one is a concert organiser, as opposed to a concert goer. I realised that, sadly, Gordon did not have my full attention, because there were other things to think about as well – making sure that I didn't make any stupid mistakes with the sound desk, that the stage lights were behaving themselves, getting some decent photographs, whether the person I had seen wandering around the foyer was entitled to be there – all distractions. So I now know that if I want to really enjoy a concert, I am better off not being the organiser! For a start, I could not accurately remember exactly what he played. The first half ended with Gordon playing “The Dodo's dream”. I had first heard him play this in St Ives, then looked it up on YouTube, and could well understand why it makes him nervous – he is at the mercy of the technology, as he said before he started. And as the technology proved. I wonder how many people noticed that the Loop Station failed to engage the first time Gordon pressed the pedal? Being familiar with the piece, I immediately realised that there was a problem and was very impressed with the way he just worked around it and carried on, dealing with the 5 beat bar every time it cropped up as though he had fully intended it to be there. As he said during the interval, “I just had to go with it.” As far as I was concerned, that was musicianship of the highest order. During the interval, my wife mentioned to Gordon that two of the audience had birthdays pending in the next few days. He responded by dedicating the first piece of the second half (“Here comes the sun”) to the gentlemen in question. He played it on the Rob Armstrong 'Baby' guitar, from which he drew an almost ethereal tone; a beautiful piece of playing and something that will remain with me for a long time. And suddenly, far too soon, Gordon was playing 'Heartsong' and we knew the concert was nearly over. The applause faded and I spoke over the microphone, “Should I take it that you would like Gordon to come back?” The audience left no doubt about that. Gordon gave us 'Lucifer's Cage' and then that was it. Just one complaint – the concert was over. So many people afterwards saying what a wonderful evening it had been, the playing, the introductions between pieces, the comfortable atmosphere, when was he coming back? Comments from all sides, people who had heard Gordon many times before saying that he was better than ever, people who hadn't even known who Gordon was before the concert now total converts to his music. General agreement – a very good concert. And the best news of all? He's coming back next autumn. Thank you, Gordon, for giving us an evening of unalloyed pleasure. These were some of the comments after Gordon’s concert of 7th July. St. Gwladys’ Church Hall hosted Gordon for a question and answer session in the afternoon and a concert in the evening. Those who attended the afternoon session found that Gordon is an excellent raconteur and a thoroughly nice, humble, man – he has worked with all the big names in the music business, and still feels that others have something to teach him. The hall has a maximum capacity of about 120, but chairs had been set out for about 80. Around 60 people attended and the hall felt pleasantly full with a mixture of folk of all ages, some local, some from further afield – one couple had come up from the West Country to hear him. 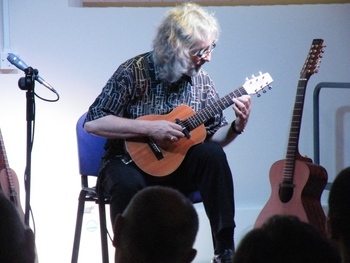 Gordon started the concert by proving that you don’t need a very expensive guitar to make good music – the instrument he played had been bought for £5 in a car boot sale and then “improved”. It certainly sounded good in Gordon’s hands! Gordon played a number of other guitars– the Armstrong “baby” and various Gordon Giltrap signature guitars. The first half went very quickly with a mixture of talk and playing. Gordon obviously enjoys talking about the electronic devices he uses, and demonstrated the various effects he could get from the delay pedals. The electronics were used to good effect on “Dodo’s Dream”, when the audience were wrapped in a cocoon of layers of music. As the comment says, it became so intense, it was hard to believe it could have got any better. When the interval came, there was a buzz of conversation. Refreshments were available, and some had brought bottles of wine. Many went to speak to Gordon, and there was a generally convivial atmosphere. To say that the second half was more of the same sounds disparaging, but Gordon is so good, there’s very little more can be said. The concert finished with the wonderful “Heartsong”, and Gordon was persuaded back on stage to perform “Lucifer’s Cage” as an encore. I have to admit, this is not my favourite piece, but it is a real tour de force – Gordon was playing so quickly that his arm was a blur. Those who attended the concert went away knowing they had experienced something very special – an artiste of Gordon’s calibre performing in an intimate setting. To say Gordon is a good guitarist is an understatement – he is brilliant. Can we have him back please?